Over the past year I have viewed the Erawan Shrine from the BTS Skytrain a minimum of 40times, it cannot be ignored. 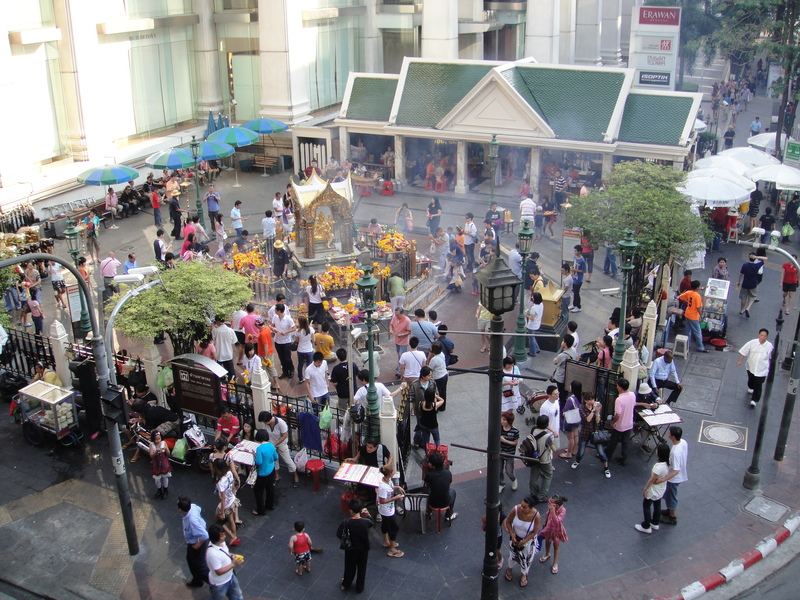 The shrine is located on one of the busiest intersections in Bangkok- the corner of Sukhumvit and Phloen Chit roads. 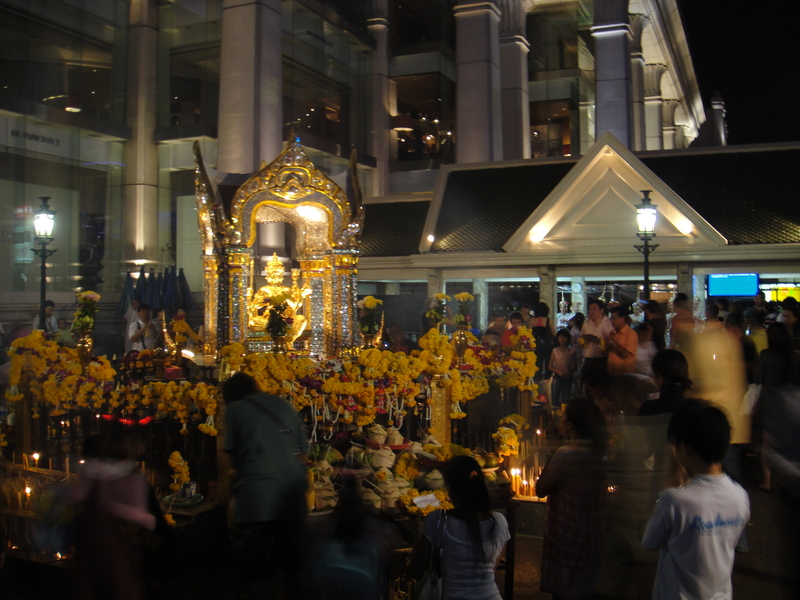 The shrine is situated directly on the corner of these two streets, at the base of the Grand Hyatt Erawan Hotel and in the heart of Bangkok’s upscale shopping malls and district. It is very well known, taxi drivers take their hands from the steering wheel to bow their head as they drive past. Thai’s walking by the shrine will always do a quick bow. r give thanks, for good fortune. Anyone can pay the dancers to do a “thank you” dance for good fortune they have received. Finding some motivation, I decided to read up on this shrine. The shrine is hindu and was built in 1956, it features the four faced creation god named Brahama. The shrine was built to eliminate the bad karma of the Erawan hotel- the hotel laid the foundation on the wrong date and encountered a massive number of challenges and missteps during construction, including injuries to workers and boats with raw materials for the construction being lost at sea. Upon completion of the shrine, the missteps and bad luck ceased. In 1987 the old Erawan hotel was torn down and the 5 star Grand Hyatt was built- the shrine remained. What amazed me about the shrine, long before I understood the story and history, is the location. Bangkok has been roundly criticized for out of control building, erecting modern office and condo buildings anywhere there is a small plot of land while destroying or failing to maintain the traditional Thai buildings. But on possibly the most valuable “corner” in the city is a bright, colorful shrine. It reminds me of New York City or Chicago, the way you can find a small church mixed with the massive buildings. The difference being how all Thai’s embrace this shrine- for that matter, all shrines- and the prominent location. In the USA, I think a church, shrine or cemetery would be relocated rather than built around or left in this kind of location. Other facts about the shrine: The shrine is filled with carved elephants, Erawan is the name of Indra’s elephant. The shrine was vandalized in 1996, a deranged Thai man took a hammer to the statue, the PM of Thailand visited the statue after it was vandalized. Shockingly after the man damaged the statue he was beaten to death by bystanders. Want to see the shrine but cannot fly to BKK? Visit Caesar’s Palace in Vegas, they have a replica. This entry was posted in Bangkok, Landmark, Sightseeing, Thailand and tagged Bangkok, Buddhism, Erawan, shrine, sightseeing. Bookmark the permalink. Really love this post, thanks.